What is real, the man or his mask? Philosophical eh? 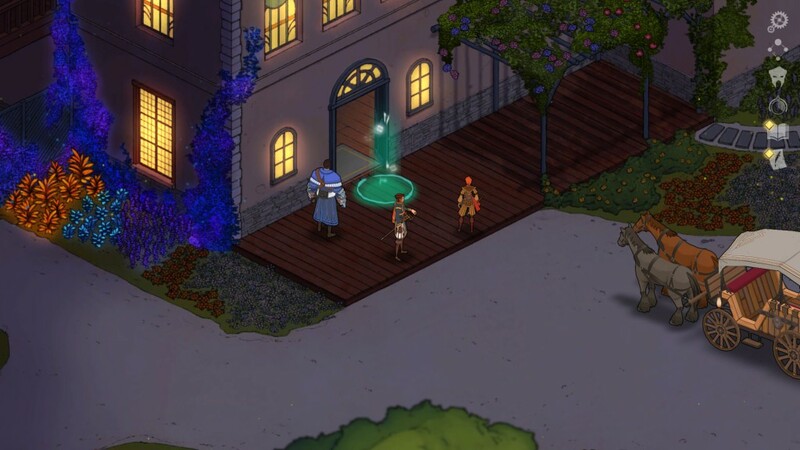 It’s a question that’s being whispered in Masquerada: Songs and Shadows. A strong story-driven game with a refreshing look. Delve into the Venetian fantasy world where masks are vital for those who want power, and maybe even more for those who want to stay alive. Where to begin. This game has such an extensive story that makes up the biggest part of the game. It’s a world of magic.There is a linear main story where you, Cicero Gavar, are the protagonist. Branded as a war criminal because your deceased brother was a criminal, you are called back to the city that exiled you. You are asked to solve a certain mystery involving people dying or going missing. It’s an investigative story about mascherines, Venetian masks granting ordinary people extraordinary powers with elements involved that play a big part in this world. They are highly wanted ever since their amount seemed to decrease after a war took place. This due to the fact that a mascherine on somebody’s face will disappear when the wearer dies, though it’s not clear why. Your investigation involves maskrunners, which is the name for people who use their acquired mascherine for unlawful purposes. More information that slightly explains the world can be found in the extensive lore throughout the game. Pieces of lore are unlocked by interaction with places that give you information about places and its inhabitants. About the past, present, rich and poor people, the scum, the heroes and more. It’s a world divided by classes, factions and war. 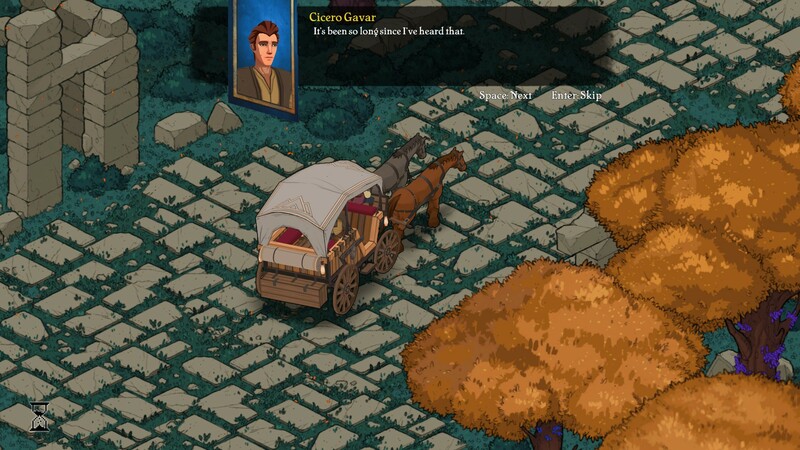 Besides the conversations Cicero Gavar has with other characters and the lore, there are many visual novel animations in between the game giving the clear, linear story an extra bit of communication. Communication that is greatly needed a lot due to its vast amount of information. 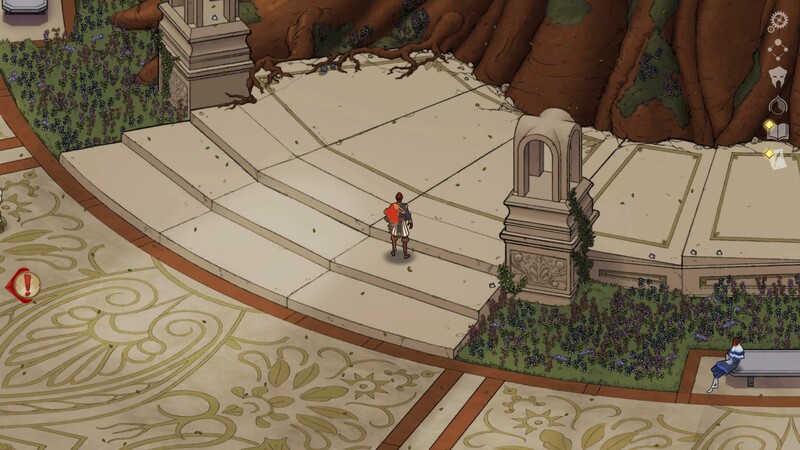 Hand-drawn goodness with a magic flair and Venetian, slightly royal style is what Masquerada exists of. The world is beautiful and screams for more interaction, yet most is not meant to be interacted with. Because the story is quite linear, the graphics, in this case, have the purpose to let you ”enjoy the ride” while following the story. The layers of graphics consist of different layers. The first one: Hand-drawn backgrounds and other objects that are not to be interacted with. The second: NPCs and players that can be moved and models that have interactive elements because they are breakable or pushable. The main interaction you get otherwise is divided into two things: There is either a fight with some enemies, or glowing spots that mean you can get knowledge about the environment, continue to another piece of the map, or interact with a key element that’s vital to the story. Due to the lack of any other interaction, like has been said, the graphics have the main purpose of just making everything look really pretty. The thing that is immediately noticeable in the game, from the point you enter the menu, is the classical music, mostly with a choir. This type of music remains throughout most of the game and it compliments the character of the game so extremely well. Sometimes it’s slightly different and more ambient, but whatever you hear, it’s an elevation of the graphical aspect. It has to make the game look and sound really nice and the graphics and sound are a blend that simply fits. Then something else. Something major about this game. The voice acting! The bloody voice acting! It’s incredible. It sounds like they hired professional actors that could be in any major Disney animation and each and every character feels so rich by the voices that support them. In a game that’s mostly about the story, this makes a big difference. 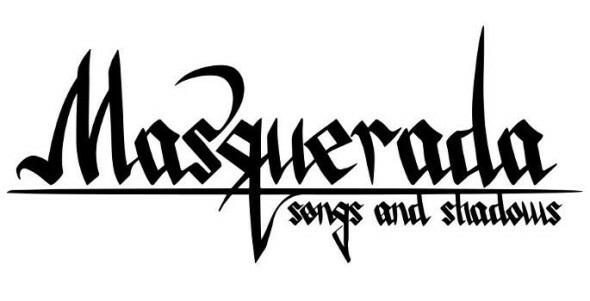 Masquerada: Songs and Shadows can mostly be defined as an RPG. However, it sometimes feels more like a book, a movie or an anime you are playing through. This is not necessarily bad, but it gives an indication of what kind of game it is. There is some action, but honestly, it’s not that challenging or complicated. Most of the game you are simply walking from point A to point B, following a linear story where occasionally a monster or NPC pops up. The story aspect is worked out properly though. Not only the people and the conversations you have with them, also NPCs talking to each other at quiet times extend some of the depths, as well as a very extensive lore you are able to read bits and pieces of as soon as you unlock parts. 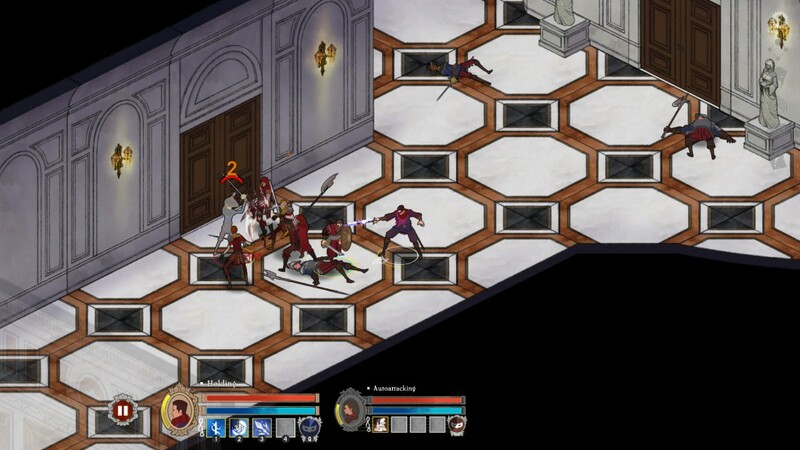 The parts that you are able to fight, mostly happen by what looks like a brawl of your team (mostly two or three people) versus whatever the number of current enemies is. In an easy fight, it kind of feels like you can just wait till your characters finish, occasionally pressing a button. In more complicated fights the system is something we also see in games such as Dragon Age: Origins. As long as you don’t stop time you can just press buttons that make you use skills your character knows. The allies you don’t control have selectable A.I if you wish, though this does not seem too necessary. You can also circle through your allies to give them commands individually, or stop time to take your sweet time deciding your tactics. These options, as well as the option to switch stances ranging from defensive to offensive, don’t really seem to matter that much. Mostly it’s enough to use the skill points you acquire by following the story and beating enemies to gain and upgrade skills on each ally and simply use these skills. Each character has its own element, but besides visual effects, this seems to be more important story-wise than for the gameplay. Also, there is no real healing involved. If an ally falls during battle, you can revive them while fighting or wait until the battle is won. Nothing is lost by being defeated, again pointing towards the fact that the story is the more important factor in this game. Granted, you might need some patience to play the game. Or maybe being in the right mood is a better description. Since there is more reading and watching involved than fighting, the game might not be for everyone. However, it does offer some very fine graphical and musical aspects that offer you an experience and story that might as well have been a good movie or book. Overall it could be defined as a fine piece of gaming art, that might possibly be remembered as a classic in a few years. If you enjoy a good story, and the mood and timing are right for you at some point, this game is definitely advisable.